Dancer and vocalist Sheila Anozier and musician Paul Beaubrun and his band performed at Pioneer Works in Brooklyn, November 11th, closing night of the exhibiton "Pòtoprens: The Urban Artists of Port-au-Prince"
Sheila Anozier, is a New York based dancer/choreographer/teacher. 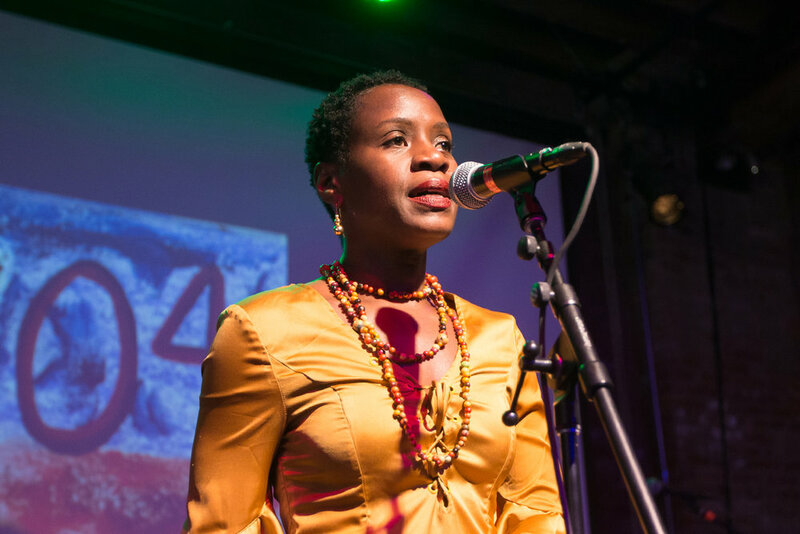 At Pioneer Works she sang Haitian folkloric songs and danced to the drumming of Tiga Jean-Baptiste. A slide show displayed her illistrations for a book of adaptations of Haitian Folk Tales as a backdrop to her performance. Paul Beaubrun was backed at Pioneer Works by longstanding Zing Experience bandmates, Yves “Chico” Boyer on bass, Morgan Zwerlien, tanbou and drum pad and Peter Barr, on drum kit. The songs largely drawn from the 2018 release “Ayibobo”. Paul Beaubrun spoke to us after his show about unity, a theme that is also expressed his music. on “Ayibobo”. The Haitian creole word Ayibobo has spiritual connotations, the album has introspective moments, interpreted literally a personal journey, but entwined with that of the Haitian people, beginning with a track entitled Naissance and concluding with “Rise Up”. When music from the Caribbean reaches international ears it at times is heard out of context. That was not the case at Pioneer Works, it was an uplifting celebration of Haiti held in conjunction with the art exhibit “Pòtoprens: The Urban Artists of Port-au-Prince”. While Ayibobo is a rather personal and introspective album, In performance Ayibobo is a rallying cry, an affirmative audience response. The audience was filled with fans from Haitian community and eagerly responded when called upon to join the refrain. Paul told us the space within his music was more like African music, particularly with these musicans The quartet format delivered the songs with force. Each musician very expressive. Paul’s razor sharp guitar was complemented by Boyer who slid his hand up the fret of his bass creating a throbbing effect that was evocative of roots rhthyms floating over foundational interaction of Zwerlein and Barry. “Ayibobo” the title track is addressed to his mother, Mimerose Beaubrun a foundational member of the Rasin movement in Haiti with the group Boukman Eksperyans. The lyrics recall his memories of fleeing Haiti during the coup that ousted Jean Bertrand Aristide. It was a dangerous time, his guitar work captures the raw emotion of that experience. The music of the Caribbean is continuum along the antillan arc where the popularity of cadence rampa (Haiti) and calypso (Trinidad) evolved into cadence-lypso (Dominica) and laid the basis for later forms such as the zouk scene of Martinique, Guadeloupe and Paris and the soca music of Trinidad. 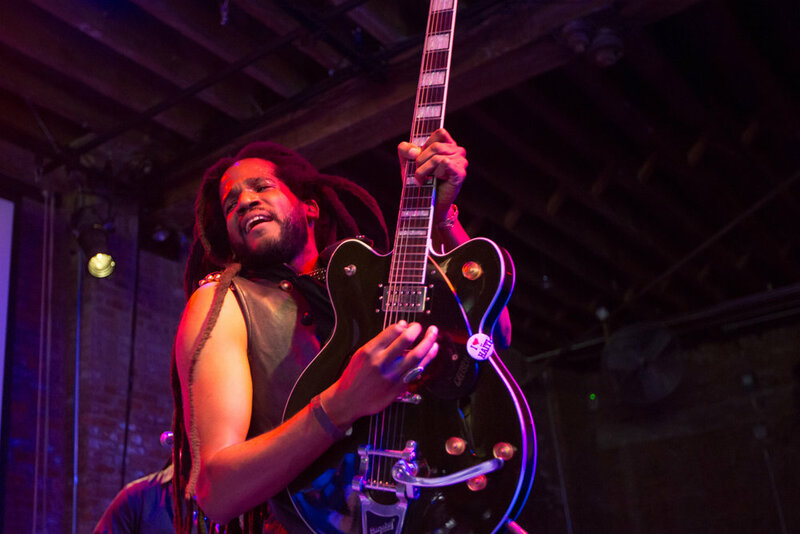 Beaubrun’s music is a spectrum of his musical influences including reggae, rock, and blues, particularly in the guitar playing, without straying from its Haitian roots. Paul first learned to play guitar from his father, also a guitarist, so as a youth he became familiar with the music of rockers such as Hendrix, Santana, and Peter Frampton, who he remembers for his use of the talkbox. Its was the expressiveness of the instrument that interested him and later he fell in love with early bluesman such as Robert Johnson, who wrote “Crossroad”. Those influences can be heard in his playing. Quick slashing blues based riffs measured by the petro rasin rhythms, and call and response vocals with the band made for an exhilarating listening experience. Paul Beaubrun’s next scheduled New York show is January 4th at the Mercury Lounge on East Houston Street. Paul toured this past May, June and July after the album’s release, he then joined Jackson Brown in Haiti with several other artists including Habib Koite of Mali, each contributed two songs to Brown’s new project to be released in 2019. In mid January he will record at Jacmel’s Artist Institute studio. Participating artists will include Michael Brun, Trouble Boy, Niska and artists from Boukman Eksperyans, and Zing Experience. The goal is to keep the recording process as close to live as possible. Following the session he will perform at the Port au Prince Jazz Festival, January 24th. The artists will reunite in March for a tour of the US and Europe.